There are only three days left of Open Field, and I am sure that the events to come are going to be quite memorable. Nevertheless, as the curtains draw to a close on our cultural commons, we are all becomming a bit nostalgic about our favorite Open Field events. It was incredibly difficult to choose, but let me share with you my top ten. 1. On the rainy First Free Saturday in June, Roma di Luna managed to make tons of small children fill up the cinema and dance around, proving that live music conquers inclement weather. 2. Every Thursday, several small, but valiant LARPers come. I interviewed them, and you can watch it above! 3. Chromatic summer was always a lively forum to express your innermost feelings about colors. Certain colors became controversial, nostalgic, frustrating, or inspiring. 4. 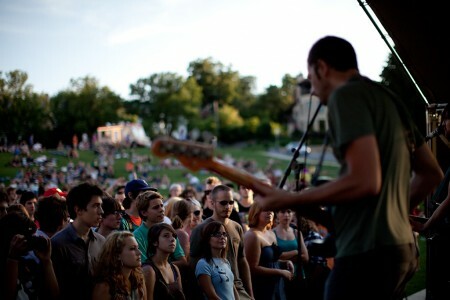 Open Exposure brought hundreds of people to the field to check out local teen talent. There was a field full of sun tents, umbrellas, and plaid! 5. The National Poetry Slam Preview was the perfect send-off for our triumphant Twin Cities poetry slam winners. I was not completely sure what a poetry slam entails, and now I know it is equal parts literary magazine, rapping, and Monty Python. 6. Commons Census’ aim was to bring together people from the Open Field to discuss what a commons should be, or specifically, what an institution/creative commons should be. I found that despite all of our theorizing this summer, it can be challenging and exciting for two people to try to agree on what they could share together. Can we share ideas, property, medicine, or specialized knowledge for free? 7. On the 2nd to hottest day of the summer, a series of Pac Men ran down the Open Field hill faster than I could document it. 8. On the very hottest day of the summer, Red76 set their Anywhere/Anyplace Academy afloat on the Lake of the Isles. It was a day of exhaustion, intellectual discourse, and ultimate triumph. 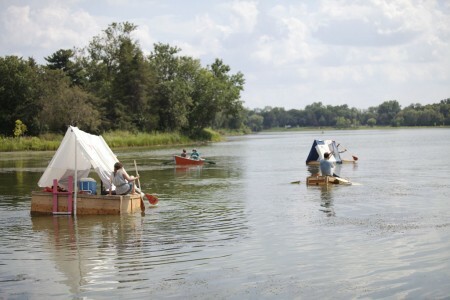 Every hand-crafted re-purposed raft not only floated, but held people above water! 9. Sam Wainwright Douglas’ film on Sam Mockbee, Citizen Architect: Sam Mockbee and the Spirit of the Rural Studio, inspired all audience members. Preceding Red76’s Surplus Seminar, the film brought up timely questions of waste, surplus (materials and knowledge! ), and grassroots education. 10. Every week Drawing Club brought artists, families, and passersby together to create communal drawings. Tomorrow is their finale: an exposition of the final Drawing Club works and a celebratory thank you for all participants. The next three days on the Open Field are going to be quite exciting. There is something for everybody, Open Field regulars and curious passersby alike.